Leading Manufacturer of waterproofing compound two component from Valsad. Perma Guard is a polymer modified cementitious acrylic waterproofing system with a very wide scope of applications in waterproofing and corrosion inhibition situations. Perma Guard is a two-component material which forms a flexible reinforced membrane upon curing. 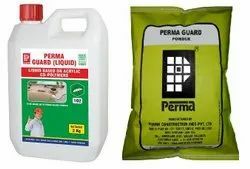 Perma Guard is a polymer modified cementitious acrylic waterproofing system with a very wide scope of applications in waterproofing and corrosion inhibition situations. It is easy to use. Just mix the pre-measured and packed liquid and powder components of Perma Guard and brush application. Looking for Waterproofing Powder ?